Oliver Blume, Chairman of the Executive Board of Porsche AG, at yesterday’s New Year Reception at the Porsche Museum. Fast. Pure. Emotive. For the past 70 years, the Porsche brand has been synony-mous with sports car construction at the very highest level. The first vehicle to bear the Porsche name was registered on June 8, 1948: It was the 356 “No.1” Roadster. This is the day on which the Porsche brand was born. The Type 356 turned Ferry Porsche’s dream of a sports car into a reality. “His vision at that time embodied all of the values that still define the brand to this day”, said Oliver Blume, Chairman of the Executive Board of Porsche AG, at yesterday’s New Year Reception at the Porsche Museum. 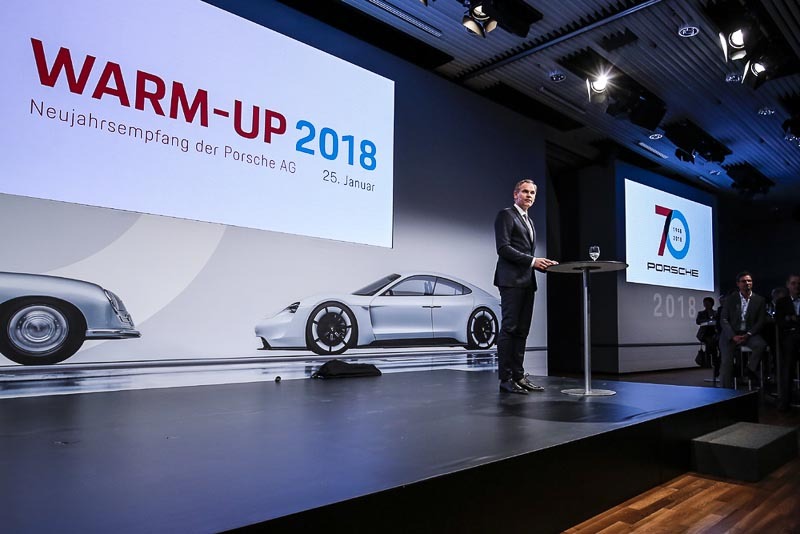 Representatives from the state of Baden-Württemberg as well as from the city of Stuttgart and the worlds of politics, economics and society, joined Porsche to celebrate the beginning of its anniversary year with the slogan “70 years of the Porsche sports car”.